A harrowing compilation of security video provides the clearest picture yet of how Wednesday's attack unfolded. It took just 80 seconds for gunman Michael Zehaf-Bibeau to go from fatally wounding Cpl. Nathan Cirillo to finding himself one unlocked door away from Prime Minister Stephen Harper and the entire Conservative caucus. A harrowing compilation of security video provides the clearest picture yet of how Wednesday's attack in Ottawa unfolded. The video, which was released by the RCMP on Thursday afternoon, reveals that after shooting Cirillo at the National War Memorial, Zehaf-Bibeau got into his car and made a U-turn in the direction of Parliament Hill, just a few hundred metres away. He abandoned the car outside the East Gate on Wellington Street and sprinted through the posts meant to deter unauthorized vehicular traffic, as bystanders fled. The video shows he approached a line of ministerial cars parked outside the East Block, commandeering one of those vehicles, which he proceeded to drive right up to the front steps of Centre Block with several RCMP vehicles in pursuit. "It only took one minute and 20 seconds for this individual to go from Wellington to Centre Block," RCMP Commissioner Bob Paulson noted. Zehaf-Bibeau engaged in a brief exchange of gunfire with House guards as he entered Centre Block. "As the suspect entered the building, there was an altercation with an RCMP officer, and some shooting occurred," he noted. 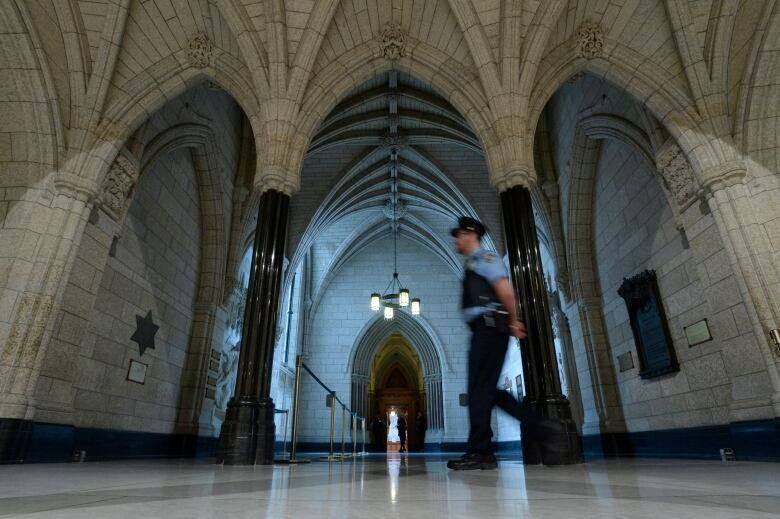 Inside those Centre Block doors, Const. Samearn Son, a 10-year veteran of the Commons security team, was the first person to try to stop him, sources have told CBC News. Son immediately noticed the long rifle in Zehaf-Bibeau's hand. Although he was unarmed, Son lunged at the shooter, grabbing the gun and pulling it toward the floor, screaming "Gun! Gun! Gun!" That alerted the plainclothes officers inside the building, who have weapons. During the ensuing struggle, Son was shot in the foot. He was taken to hospital later in the day, and released that night, but with a permanent souvenir — the bullet will stay in his foot, sources say, as it would do more damage to remove it. Son has been hailed as a hero. Sources tell CBC News that if Son hadn't taken the actions that he did, the situation could have ended up much worse. Zehaf-Bibeau continued up the stairs, but by that time, the officers inside had been alerted by Son's cries. "The shooter went down the hall, at which point [Sergeant-at-Arms Kevin] Vickers did engage with him," Paulson said. "The suspect repositioned himself to get a better shot at Mr. Vickers, and witnesses heard a multitude of shots." Zehaf-Bibeau was killed by those bullets from security officers and Vickers. Vickers and his team "are heroes," Paulson told reporters, "as are my officers and [Ottawa police Chief Charles Bordeleau's] officers." Speaking with reporters outside the House, Justice Minister Peter MacKay said MPs should think carefully before making "any rash decisions" on changing Hill security protocol. "Yesterday was a traumatic day, it was a tragic day, but it was a triumphant day," he pointed out. "It could have been much worse. Let's not forget the potential for even more harm did exist." Asked about the possibility of arming guards, MacKay would only say that it was something that would likely be examined closely. Conservative MP Daryl Kramp agreed that it was "disturbing" that someone could, as a journalist put it, "walk up to the front entrance of the Parliament buildings and start shooting." "We’ve taken our freedom so much for granted, that sometimes, we do become complacent as individuals," he noted. He pointed out that the heads of both the RCMP and CSIS, as well as Public Safety Minister Steven Blaney, testified at committee just days before the attack took place. "They stated very, very openly that the threat is real," he recalled. "We have to be vigilant, and I think this … has really brought to the forefront the strength of their statements." Kramp said that, he, personally, is in favour of arming Hill guards, but noted that it isn't up to just him. "I think our services and all of our support staff will certainly have these discussions," he added. "The collective forces will obviously be sitting down and evaluating what took place and dealing with all the preventative measures that either can or will be in place." In a brief statement on Thursday afternoon, House of Commons Speaker Andrew Scheer informed his colleagues that he has ordered a "thorough report" of the incident, which he intends to share with the all-party Board of Internal Economy that oversees Hill administration. "I have also taken additional steps to ensure the integrity of the ongoing investigation into yesterday’s events," he added, which include closing Parliament to visitors and cancelling tours for the day. "However, I have stressed that these must be temporary measures," he added, to cheers from MPs. "Parliament must remain an institution that is both open and secure."